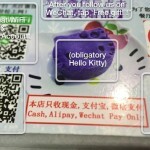 Covering everything from emerging icons (T-shirts and smiling shopping bags), to positioning the “Send” button, to how people use wifi, to payment options (“Cash Alipay Wechat Pay only”), to AI chat bots. I didn’t know about Dan Grover‘s blog until I saw it on Boing Boing, but it is an eye opener when it comes to Chinese mobile and internet usage. This is not only about mobile UI, but also covers broader consumer behavior and technology trends in China – some of which will migrate here also. Whether you plan to do business in China or not, if you are interested in user experience, eCommerce or mCommerce you need to read it.